Blending cultural, religious, and media history, Tona Hangen offers a richly detailed look into the world of religious radio. She uses recordings, sermons, fan mail, and other sources to tell the stories of the determined broadcasters and devoted listeners who, together, transformed American radio evangelism from an on-air novelty in the 1920s into a profitable and wide-reaching industry by the 1950s. 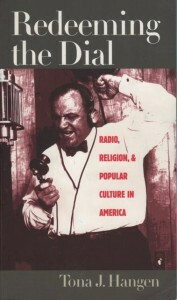 Hangen traces the careers of three of the most successful Protestant radio evangelists–Paul Rader, Aimee Semple McPherson, and Charles Fuller–and examines the strategies they used to bring their messages to listeners across the nation. Initially shut out of network radio and free airtime, both of which were available only to mainstream Protestant and Catholic groups, evangelical broadcasters gained access to the airwaves with paid-time programming. By the mid-twentieth century millions of Americans regularly tuned in to evangelical programming, making it one of the medium’s most distinctive and durable genres. The voluntary contributions of these listeners in turn helped bankroll religious radio’s remarkable growth. Revealing the entwined development of evangelical religion and modern mass media, Hangen demonstrates that the history of one is incomplete without the history of the other; both are essential to understanding American culture in the twentieth century.